I have always wanted to learn how to make a video game. I don’t have a deadline – but, I would like to make consistent progress towards that goal. I have quite a collection of books on this topic – including What Video Games Have To Teach Us About Learning and literacy by James Gee, Chris Crawford on Interactive Storytelling by Chris Crawford, Digital Storytelling: a creator’s guide to interactive entertainment by Carolyn Miller, and the Gamification of Learning and Instruction: Game-based methods and strategies for training and education by Karl Kapp. I have many others. I want to read these books – but, with school, and work, and life – I am lucky if I get to read a few chapters in them before they end up back on my shelf. I have read about it online – in articles such as “5 Teaching Tips for Professors—From Video Games” by Jeffrey R. Young featured in the Chronicle of Higher Education. I spent time exploring sites whose focus is on how the creation of video games supports learning at sites such as Globaloria and the World Wide Workshop. From sites like this I found people that I wanted to hear more from such as Idet Harel Caperton who founded the World Wide Workshop for Children’s Media Technology & Learning. I am interested in Kurt Squire’s work and writings on this topic and his web page has links to many of his activities that connect video games to learning. Mark Overmars developed software that allows someone like me to create games that are really neat. It is called Game Maker and you can really learn a lot by using his book, The Game Maker’s Apprentice that he wrote with Jacob Habgood. This walks you through tutorials that are awesome and fun. I was able to complete a couple of chapters before life took over once more and – I dearly want to go back and try some more. I sometimes feel discouraged that this interest must always be put aside while I rush through my day barely meeting my obligations to work, studies, and the realities of daily living. But, someday – I would like to commit time to learning more about video games and how they can facilitate learning. I want to read these books, follow the communities that these people are involved with, and learn how to make video games. There are some things I like about an LMS. It’s predictable – mostly stable and dependable – and it can support the administrative tasks pretty well. It’s convenient. It does a job. In order to thrive or even just survive, institutions of higher learning need to gain the ranking and stamp of approval of key organizations. They must document that their curriculum are tieds to concepts that are listed and to prove that they are meeting certain standards. How better to collect and organize this kind of information then with data based platforms that track everything. Technology continues to present new opportunities for students to become creators of content rather than just consumers. Advances in social media resources allow the development of communities of learners – and now all of these resources are available 24/7 on our cell phones. I think that the way that our Instructor for this Social Networking course has set up the three web-based sites to support the learning goals is the way to go. The right tool for the right job seems to be the answer – If you need security and/or statistics use the LMS. 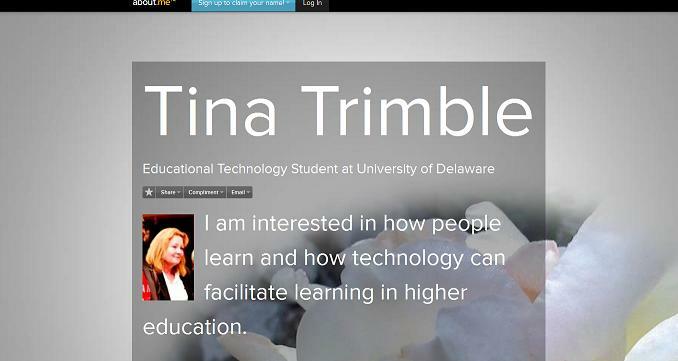 If you are trying to get your students to create and explore – open a site in wordpress. What are the implications of “going Edupunk” with learners? Learners who “go Edupunk” – are life wide and lifelong learners. They are autonomous. These learners are destined to be active in learning communities and actively create content to share with the world. They are the “movers and shakers”. 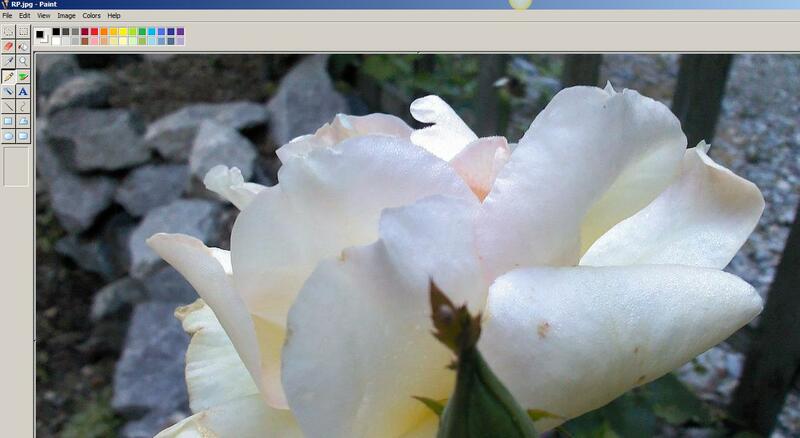 When I first put my About.me page up I used a picture of a flower that I had snapped in my garden on my way to work one day. The rose filled the card. There was a spikey green part of the flower that went right through the middle of the image. The image dominated the screen and I feel like it was distracting and too busy. 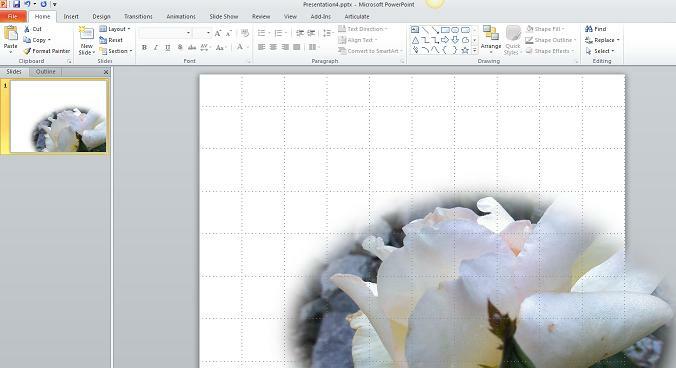 I put the image into powerpoint and played around with the angle and placement on the slide. I tried to lose the spikey green thing in the middle of the screen. I then used some of the options on the tool bar to blur the background to make the image softer and hopefully fade into the background. I worked a little with the font size and ended up with a different look. I think I need to do something different with my picture too – but, haven’t come up with any new ideas. I went to my wordpress site made a similar switch out with the same image. But, I used the stage before I blurred the background. This made it a little crisper and I thought this would work as the image is only a strip across the top. I liked the feature that let me choose the portion of the picture that I wanted to show. Week 5 – Getting The Party Started! It seemed a little intense – but, I found the link where they recommend a list of their favorite blogs. They include what the blogger’s main interest is and why they like the site. I cruised through the list of 50 or more and pulled out five of them that I found most interesting. They are listed below. I went to each blog and lurked around reading and checking out links on the pages. If I got a good feeling about the conversations – I kept them on the list. In cases where the link was dead – or the person’s direction did not feel like a good match for my interests – I deleted them from my list and went back to pick out another one form the Association’s recommendations. I ended up with the five here and subscribed to receive each of their blogs via email. 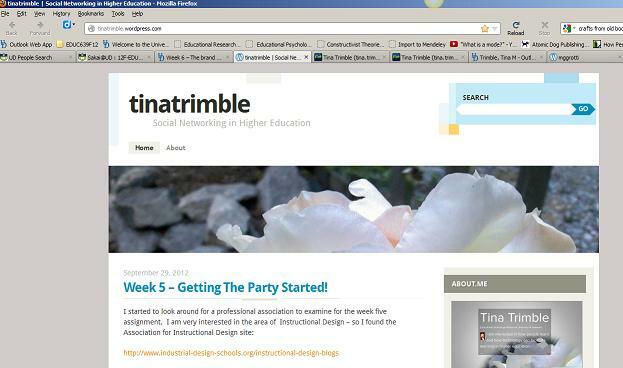 Meanwhile – I had wandered onto a blog that was not listed on this Association’s favorite blog list – but, I was so fascinated by the topics that were covered – that I found myself spending hours reading through all the stuff the author, “Tom Kulhmann” had put forward about being an Instructional Designer. He had a seemingly endless array of tricks and tips, and links to instructions and videos on how he had done things. Some of the posts went back quite a few years – so there was a lot to choose from. After awhile I started reading what his followers were talking about – and I began to feel excitement about the conversations they were having with each other. It reminds me of the class discussions we have in the forums of our classes at UD. It made me think about how I felt when after watching the video of Mat’s chat with Laura Gibbs – I had sent a Thank you comment to her – and was stunned when she answered me! It occurred to me that we could actually have a conversation at some point. I felt engaged with the topics. I became more and more eager to read the next post. I found myself interested in what the conversation was and look forward to joining in. I guess this is what social networking is all about! It’s got to be a party that you want to be at to be truly rewarding. Sorry it took all these words to get to this point – I guess sometimes it’s that kind of a journey. I look forward to reading the other sites’ blogs as they come in – and hope that some of them prove to be as interesting as the one I am following. “eLearning Technology: eLearning Technology is written by Tony Karrer, an expert on the subject of eLearning and how technology can affect education. The blog contains information on topics such as low-cost quiz tools and how to hold effective web conferences. Why We Love It: The blog’s posts are detailed, and the information in them is highly useful. The blog is also updated frequently. It looks like a lot of fun – but, it does not look like my niche. I do like the focus – on games for good.